I’m going to give you the answer before I even start this article: no. Interface calls with multiple concrete implementations in a single call site will not be inlined. While neither of those rules are delegate-specific, you can infer that a delegate call might have similar constraints. You could ask around on the Internet. Somebody on stackoverflow.com will surely answer you, but I want to show you how to find out the answer to this for yourself, which is an invaluable skill for harder questions, where you might not be able to find out the answer unless you know people on the CLR team (which I do, but I *still* try to find out answers before I bother them). First, let’s see a test program that will exercise various types of function calls, starting with a simple method call that we would expect to be inlined. The code we’re interested in inlining is the Add method. Don’t confuse that with the NoInlining option on TestNormalFunction, which is there to prevent the test method itself from being inlined The test method is there to allow breakpoint setting and debugging. Build this code in Release mode for x86. Then open Windbg. If you’re not used to using Windbg, I highly encourage you to start. It is far more powerful than Visual Studio’s debugger, especially when it comes to debugging the details of .NET. It is not strictly necessary for this particular exercise, but it is what I recommend. To get, Windbg, install the Windows SDK—there is the option to install only the debugger if you wish. Enter the command g for “go” (or hit F5). The program will then break on the load of clrjit.dll. Enter the command .loadby sos clr – this will load the SOS debugging helper. Enter the command !bpmd DelegateInlining Program.TestNormalFunction – this will set a managed breakpoint on this method. Enter the command g to continue execution. Execution will break when it enters TestNormalFunction. Now you can see the disassembly for this method (menu View | Dissassembly). There are some calls there, but none of them are to Add—they are all functions inside of mscorlib. The call to the dword ptr is virtual function call. These are all related to calling Console.WriteLine. The key is the instruction at address 00b80072, which moves the value 3 directly into register edx. This is the inlined Add call. The compiler inlined not only the function call, but the trivial math as well (an easy optimization the compiler will do for constants). So far so good. Now let’s look at the same type of thing through a delegate. Change the Main method above to call TestDelegate instead. Follow the same steps given previously for Windbg, but this time set a breakpoint on TestDelegate. Things got a bit more complicated. As you’ll read in Writing High-Performance .NET Code, assigning a method to a delegate actually results in a memory allocation. That’s fine as long that operation is cached and reused. What we’re really interested in here starts at address 00610097, where you can see the value 2 being pushed onto the stack. The next line moves the value 1 to the edx register. There are our two function arguments. Finally, at address 006100a4, we’ve got another function call, which is the call to Add, and the key to this whole thing becomes clear. The address of that function had to be retrieved via pointer, which means it’s essentially like a virtual method call for the purposes of inlining. You can also do the same exercise with a lambda expression (it will look similar to the delegate disassembly above). So there’s the simple answer. There is one more interesting case: a delegate that calls into method A that calls method B. We already know that method A won’t be inlined, but can method B be inlined into method A? You can do the same analysis as above. You will see the call into the delegate/lambda will not be inlined, but there is no further function call, so yes, Method B can be inlined. There you have it. Even though, the answer was pretty clear from the start, you at least have the tools to answer it or yourself. 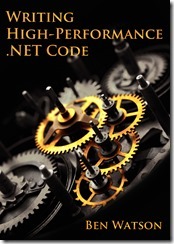 Don’t be afraid of the debugger, or of looking at assembly code, even for .NET programs. This entry was posted in .NET, Code, CodeProject and tagged .net, assembly, Code, debugging, delegate, inlining, Windbg on July 25, 2014 by Ben.